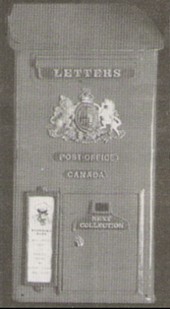 When the two young, Edwardian ladies pictured in Kathryn Hansuld Lamb's book, The Quiet Hobby, deposited a letter into a King Street, Berlin, Ontario, (now Kitchener), street letter box in 1912 they could not have imagined that the little, red mail box would some day become a sought-after collectible item. Although these particular types of street letter boxes were fastened to lamp or hydro poles, much as some are even today, their predecessors known as pillar boxes, dating from the 1850s, were stand-alone models that measured close to 5 feet in height. They were named pillar boxes because of their pillar-like or round design like an oversized stovepipe. But rather than being fastened to a hydro or lamp post, like the later street letter boxes, they were secured at ground level onto a cement base.A quotation from the March 16, 1860 edition of the Montreal Gazette describes an 1860s-era pillar letter box as follows: "A hollow, cast iron pillar, standing 4 feet 9 inches above the ground, in which it was embedded, 14 inches wide, with a slit at the top, slanting upwards. The letter is pushed up in the direction of the top of the box, when it drops over and falls nearly 5 feet to the bottom, where there is a door fastened with a lock which is claimed to be proof against picking." This particular design was apparently a secure mailing system as according to a letter from Kenneth S. Mackenzie, a postal history research officer with the National Postal Museum in Ottawa, "the Assistant Postmaster General of the U.S. was thinking of adopting this type for New York City, which was having troubles". What the Montreal Gazette article did not elaborate on was a secondary use to which pillar boxes were put: advertising. From period illustrations it is obvious that the Post Office Department did not miss a beat when it came to selling advertising space. Attached to the top of each pillar box was a four-sided billboard displaying ads for everything from soap to engine and electrical motor repairs to cleaners of ladies' coats. An ad for Taylor's Borax Soap, for example, is seen on a number of different models pictured in the national archival collection in Ottawa. Designing a satisfactory street letter box allegedly involved years of experimentation and tinkering. It had to be tamper proof and able to withstand the determined efforts of pilferers trying to abscond with mail that frequently included letters with money enclosed. We need to remember that the 19th-century was a time when cash was king. Cash transactions were the norm rather than the exception, as is the case today, and the postal system needed to safeguard the public's trust in the mail it carried. Some would-be street letter box inventors achieved a measure of success; others did not. As Canada's largest city at the time, Montreal led the way in the use of pillar letter boxes. According to a Post Office Department notice, dated May 1852, seven "Receiving Boxes for Letters and Newspapers have been established at the following points in the City of Montreal." The notice then went on to list the locations that included the corner of Panet and St. Mary Streets, Wellington and Dalhousie, St. Joseph and Inspector Streets, and several others. One box was placed at the Lachine Railroad Depot which is noteworthy if we recall that the first Railway Post Office was not put into service in Canada until one year later although, admittedly, letters were carried by railways prior to the establishment of the first letter sorting facility aboard a train. Toronto was not long in following Montreal's lead in providing street mail pickup for its citizens. According to J.G. Cunnigham, Director, Information and Public Relations for the Post Office Department in 1967, the Post Office Department inaugurated street mail pickup in Toronto on June 5, 1852. Three pillar boxes were put into service. One of the three was installed on Yonge Street although Cunningham does not give its precise location nor, unfortunately, does he indicate where the other two were located. The situation in the United States was somewhat different. Unlike the Canadian Post Office Department with its monopoly of all mail services similar to the practice of the Post Office in England which, incidentally, had total control of the Canadian postal system until 1851, the United States Post Office in its early days enjoyed no such monopoly powers. In the 1840s, even into the early 1850s, private companies such as Boyd's placed street letter boxes in areas that the company serviced. Most were to be found in high-traffic locations such as entrances to hotels, restaurants, pharmacies, and other retail stores frequented by the public. In smaller communities, street letter boxes were usually located in the centre of town or at village crossroads. Although Canadians, for some time now, have become accustomed to following the U.S. in the introduction of new products and ideas, the situation was reversed in the 19th century. 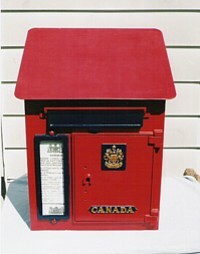 While the citizens of Toronto, Montreal, Quebec City, Winnipeg, along with other major Canadian cities, enjoyed mail pickup at various locations throughout their communities from a standard, instantly recognized, street letter box painted in what has come to be known as "Post Office Red" such was not the case in the U.S. The first officially-sanctioned street letter box by the United States Post Office was not placed into service until sometime in 1858 when Albert Potts of Philadelphia came up with a patent that the Department approved. Potts's idea was to attach street letter boxes to existing light or electricity poles or, where none existed, onto new lampposts that his company would install. Credit must be given to Potts for his forward thinking as the use of light standards or hydro poles for mounting street letter boxes was an innovative idea. 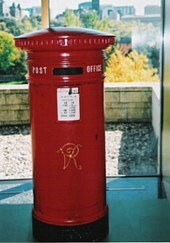 In Canada, and presumably in Great Britain where the idea of street mail pickup was introduced, the ground-embedded pillar letter boxes were still the norm. The drawback to the Potts street letter box was it size: it was much too small. As a result, it required frequent emptying. Its small size was an obvious disadvantage with an unnecessarily high cost associated with it that could only be remedied with the introduction of a larger model. For that reason, not surprisingly, the U.S. Post Office Department in 1860 awarded a contract to John Murray to manufacture 1,600 units of what it described as "lamppost" letter boxes. They were to be larger than the Potts model but unfortunately for collectors and postal history aficionados, not a single Murray lamppost box is known to have survived. Although the round, stand-alone pillar boxes remained in use in some Canadian cities until the early 1920s, what can properly be described as street letter boxes began their appearance as early as the 1860s. Toronto was first out of the starting gate with the installation of the new design in 1859. Because they were much smaller than the pillar boxes, and equipped with fittings that could be mounted on any handy post, pole, wall, or other surface, local post offices had many more options on where to place them for the public's greatest convenience. A typical street letter box, similar to the one used by the two young ladies in Berlin to mail their letter in 1912, was 10" wide, 9" deep, 14 1/2"high in front, and 17 1/2"at the back. The differing height between front and back is explained by its sloping roof, a feature designed to drain off precipitation such as rain, snow, and ice. Understandably, their sizes varied over time with the early models tending to be smaller than the later ones. Placement of a certain size box also depended on the volume of mail from specific locations. But the stock of boxes maintained by the Post Office Department, at any given time, included models of varied sizes. T. P. Murphy, who in 1937 was Superintendent, Equipment and Supply for the Post Office Department, in a letter to his Chief Superintendent, listed the dimensions of four different models kept in stock. They were numbered Street Letter Boxes No. 1, 2, 4, and 5 with No. 2 boxes being the largest: it measured 35" high at the back, 15" wide, 9" deep, and 29 high in front. Models identified as No. 1 measured 24" high at back, 16" wide, 10 1/4" deep, and 18 1/2" high in front. The remaining two, No. 4 and 5, were smaller models. By about 1900, most of the old-style pillar boxes had rusted or worn out and gave way to the new, stand-alone box design. The newer but smaller pole- and wall-mounted units were not adequate to serve the needs of parcel post customers and a replacement for the pillar-style design was needed. What the Department came up with was a square design for the obvious reason that a square box has more capacity than a round one. But instead of the traditional sloping roof of the pole-mounted box, the new design had a roof that was arched from side to side like a Quonset hut. It was also supported by four sturdy, iron legs which meant that the box itself was off the ground and less likely to rust from constant exposure to moisture or water that pooled around the base of the old-style pillar boxes. Another advantage to a stand-alone box mounted on legs is the ease with which the mail can be removed. Rather than having to manually lift the letters out of the box, the same task with the new model can be accomplished by simply unlocking the door at the bottom and allowing the letters to drop into a mail bag suspended beneath it. Made of cast iron, it retained some features of its pillar style predecessor. One of these was the separate lock. To protect it from the weather, it was covered with a lion's paw lock cover. It was not until about 1889 or 1890 that locks were built into the box itself. During the 1880s, the United States Post Office also introduced a new style letter box. Like its Canadian counterpart, it too was made of cast iron and designed so that it could be mounted almost anywhere -- on walls, electricity or lamp poles, or on the sides of buildings. In 1889 the U.S. Post Office Department ordered a new style letter box that had been designed by Willard D. Doremus. Three sizes of the design were produced. Unfortunately, they were poorly made and did not stand up well. Thieves were able to break into them to steal valuable mail. Nor did their poor construction keep out snow, sleet, or rain. Before the end of the 19th century, the U.S. Post Office Department again faced the task of finding a better quality letter box. It finally settled on a design by Eugene D. Scheble, a Toledo, Ohio, dentist. The decision turned out to be huge mistake: instead of being manufactured with cast iron, they were made of sheet metal. Unfortunately by the time the mistake came to light the Post Office had purchased nearly 50,000 of the Scheble boxes. Also, illegal deals were allegedly made and by the time the dust had settled, a number of prominent individuals were charged with conspiracy and fraud. A manufacturer from Cleveland, Ohio, Van Dorn Iron Works, was selected to manufacture a better box. Although the quality of the product was markedly improved over the Scheble box, the U.S. street letter box comedy of errors was not yet over. Apparently the Van Dorn boxes were so ugly in their appearance that local postmasters in many communities were asked to have them removed because they clashed with the ornate lampposts to which they were frequently attached. Although efforts were made to "spruce them up" with cosmetic changes such as the addition of fancy handles, these token changes failed to stifle the chorus of criticism. Of note from a Canadian perspective, the red coloured street letter boxes was another bone of contention in the U.S. Although the "Post Office Red" has not appeared to have been a problem in Canada since their introduction 150 years ago, the Americans felt that the red colour would cause confusion with similarly painted fire alarms and police call boxes. To overcome this perceived problem, U.S. post office officials directed that the street boxes should be painted a dark green. The first letter of the model number identifying Canadian boxes has traditionally consisted of the initial of the reigning monarch's name. E-1, for instance, is a street letter box produced during our present Queen Elizabeth's reign. Unfortunately for collectors trying to identify the various models manufactured over the years, King Edward VII, the present Queen's great grandfather has the same first initial as Elizabeth II although during his short reign, lasting only from 1901 to 1910, there were relatively few E model numbers manufactured. Street letter boxes with their mail clearance schedules still enclosed in their glass frame offer a bonus for collectors with an interest in postal history. These schedules frequently provide information that sheds further light on post office hours, mail delivery times, train schedules, and similar information. The extensive collection of more than 110 street letter boxes housed in Canada's National Postal Museum offers a treasure trove of information about this fascinating facet of Post Office Department artifacts from the time that England passed responsibility for postal matters to its Canadian colonies in 1852 to more recent times. For example, despite the end of Queen Victoria's reign with her death in 1901 her coat-of-arms remained on many street letter boxes until 1921 by which time her grandson, King George V, had been on the throne for 11 years. Still, there are ways for collectors to identify the great many different styles manufactured over the years. The model number is one method. Street Letter Boxes No. 1, for example, have four prominent features that are painted blue: the letter-slot panel flap, the schedule frame, the escutcheon featuring the Royal Coat-of-Arms in gold, and the cast-in panel for "CANADA" also in gold lettering. The rest of the box is finished in the official Post Office Red enamel. The Royal crest, a feature of every Canadian street letter box, provides further clues as to the date of the box's manufacture. Because street mail box contracts are tendered, manufacturers frequently attach a name plate or sticker that provides significant information concerning date and place of manufacture along with data such as model or serial numbers together with the name of the manufacturer. Without actually examining the King Street, Berlin, letter box pictured in Hansuld Lamb's book, The Quiet Hobby, it is impossible to positively identify the model number or determine when it was manufactured except to say that it was sometime after 1900, by which time pillar boxes had become obsolete, and 1912 when the photo of the two young ladies was taken. Until some dedicated researcher takes time to examine the substantial street letter box collection at the National Postal Museum and the document file at the National Archives, and publishes what is sure to be a Herculean task, collectors will have to rely on whatever data they find inscribed on actual boxes and on whatever other printed information is available. Nevertheless, their attractive markings, designs, Royal crests, and technological innovations introduced over the last 150 years make these difficult-to-find antique artifacts a challenge and joy for collectors to pursue.